Depth: Place in a hole 2 times as wide and deep as the pot; plant top of root ball at soil surface. Pollinator: Self pollinating. Northern highbush variety. Plant 2 or more varieties for good production. Jersey would be a good choice as a pollinator. Yield: Approximately 10 - 20 pounds at maturity with proper care. 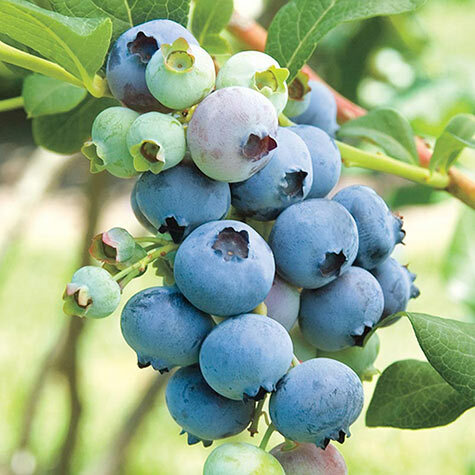 Fruit: Large to very large, firm, bright light-blue berries. Comments: Flowers do not have a fragrance. Fibrous root system. Prune to desired form in early spring up until mid-summer. Multi-stemmed wood shrub. Large, single flowers. Dark green leaves. The foliage does not show the yellowing in mid-summer that is typical of some hibiscus. Kept to 3-4 feet for a screen or hedge or pruned to make a small tree.